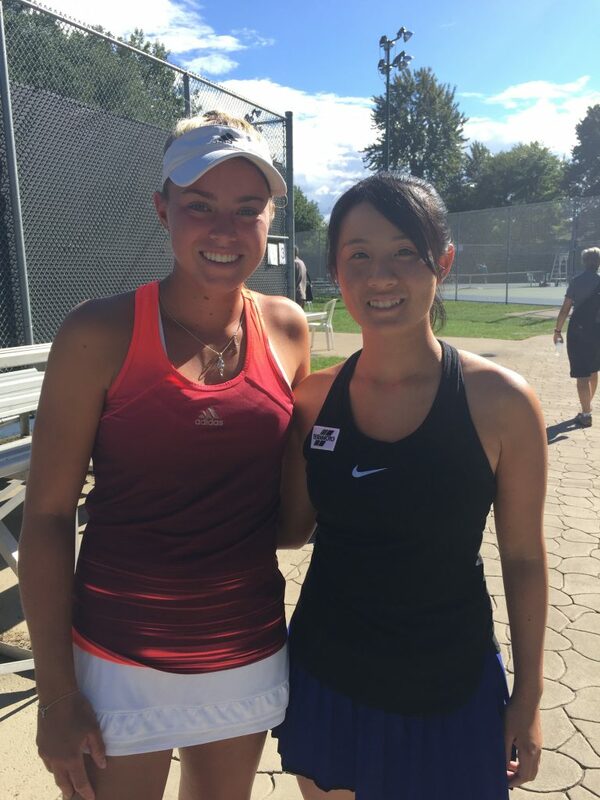 It was a busy August with three $10k Women’s Pro events as well as a return to the hard courts for the Grade 1 Canadian Open in Montreal. The first $10k tournament took Emily to Tarvisio in Italy, close to the Austrian and Slovenian borders – a stunning setting; a friendly club and some great competition, both local and international. Emily managed to put out two ranked Italian players in the 32s and 16s but then fell to a Slovenian, the eventual tournament winner, in the quarter-finals but a good start to the summer season. After a couple of days rest at home Emily headed to Florida for some clay court practice before heading south to Medellin in Colombia for the second $10k Pro event. Here she managed to fight off three Colombians in the first three rounds before losing out to Harmony Tan from France in the semi-finals. A great effort in very tough conditions – high altitude and intense heat. A semi final place was also achieved in the doubles, in which Emily teamed up with Naomi Totka of Hungary – an excellent performance for a first time pairing. From Medellin, Emily travelled south to Cali where it was even hotter and extremely humid. She drew the same Colombian woman in the first round and once again was victorious. 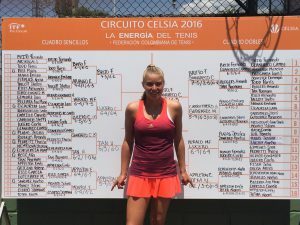 In the 16s however, Emily took on a tenacious Bolivian and struggling with the heat, she eventually lost 4-6 in the third after a three-hour battle. 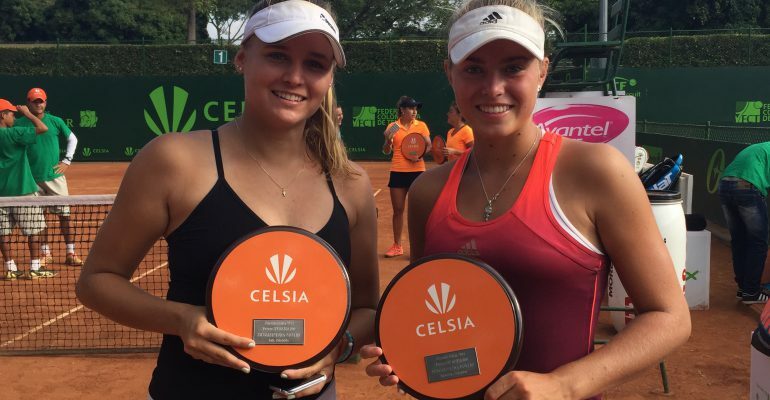 In the doubles however, Emily and Naomi teamed up once again and they managed to reach the Final – a first ITF Pro event final for Emily – eventually losing to Brito and Giangreco Campiz of Chile and Paraguay respectively. From Cali, Emily headed north to Repentigny, a suburb of Montreal, for the Canadian Open Junior event. Here Emily received a Bye in the round of 64 and then beat Cho of Taipei in the 32s to secure a place in the last 16 where she met Swiatek of Poland. Emily had played Swiatek 3 times already this year and was 2:1 in the head to head. However, it wasn’t to be and Swiatek won in straight sets and went on to win the whole event playing some excellent tennis. In the doubles, Emily teamed up with Miyamoto of Japan and they managed to reach the semi-finals, losing to the eventual winners Helgo and Rybakina. A great effort considering that Ayumi (Miyamota) spoke very little English which made communication a challenge! From Canada, Emily headed to New York for the US Open Juniors and then back to the UK for school and a couple of $10k Pro events. More on that in the end of September update! In the meantime, Emily has hit career highs in both the junior and Women’s categories this month and is now ranked 28 in the world juniors, 700 in the Women’s Singles and 618 in the Women’s Doubles.